Gene delivery using viral vectors to specifically target tumor cells gained increasing attention in the last years being efficient in combination with suicide gene approaches (Willmon et al. 2006). Several prodrug/enzyme combinations have been reported. Two systems - ganciclovir (GCV)/herpes simplex virus thymidine kinase (HSV-TK) (Ardiani et al. 2010) and 5-fluorocytosine/cytosine deaminase (CD) (Fuchita et al. 2009a) – have been widely used and their therapeutic benefit was demonstrated in preclinical studies (Greco & Dachs 2001). Adeno-associated viruses (AAV) as delivery vectors are commonly used in suicide gene therapy. The suicide gene flanked by the inverted terminal repeats (ITRs) is encapsulated into the virus particles and delivered to the target cells where suicide gene expression is mediated by cellular proteins. The iGEM team Freiburg_Bioware 2010 provides both the cytosine deaminase (CD,( BBa_K404112) and an improved guanylate kinase - thymidine kinase fusion gene (mGMK_TK, ( BBa_K404113) within the Virus Construction Kit as effective suicide genes. We demonstrate efficient and specific killing of tumor cells by enzymatic cytotoxicity assays, flow cytometry, as well as phase contrast microscopy. HT1080 cancer cell lines were transduced with directed viral particles containing the suicide genes packaged into the viral capsids. To create the functional vector plasmids, assembly of the constructs carrying the suicide genes was performed following the BioBrick Standard Assembly. All plasmids contain the enhancer-element human beta-globin intron ( BBa_K404107) and the human growth hormone terminator signal (hGH, BBa_K404108) flanked by the inverted terminal repeats (ITRs, BBa_K404100 and BBa_K404101). Assembled suicide genes are either under the control of the CMV promoter ( BBa_J52034) or the tumor-specific telomerase promoter phTERT ( BBa_K404106). Figure 1: BioBrick-compatible assembly of functional vector plasmids containing the suicide genes. The schematic figure shows the cloning strategy of the guanylate kinase – thymidine kinase fusion gene (mGMK_TK30). 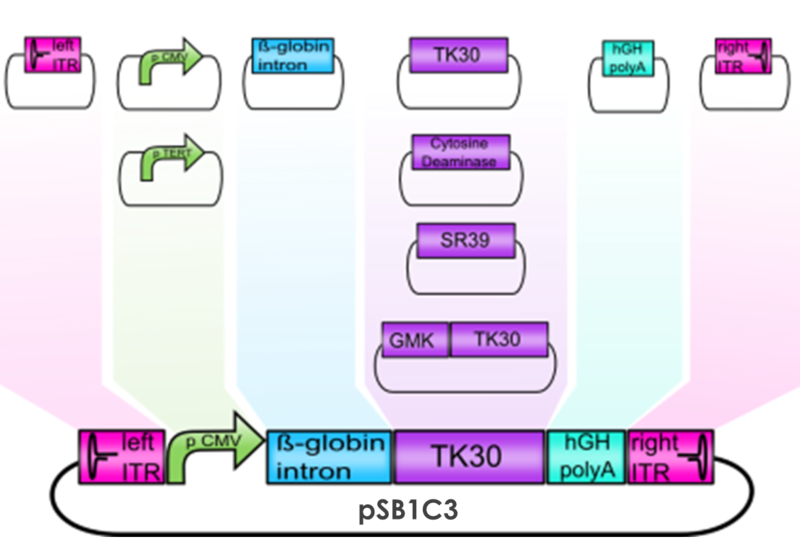 To enable modularization of the thymidine kinase mutants TK30 and SR39 ( BBa_K404109 and BBa_K404110) according to the BioBrick standard, the fusion genes mGMK_TK30 and mGMK_SR39 ( BBa_K404113 and BBa_K404315) and CD ( BBa_K404112) were modified using the QuikChange Lightning Site-Directed Mutagenesis Kit (Stratagene) for deletion of iGEM RFC10 pre- and suffix restriction sites. 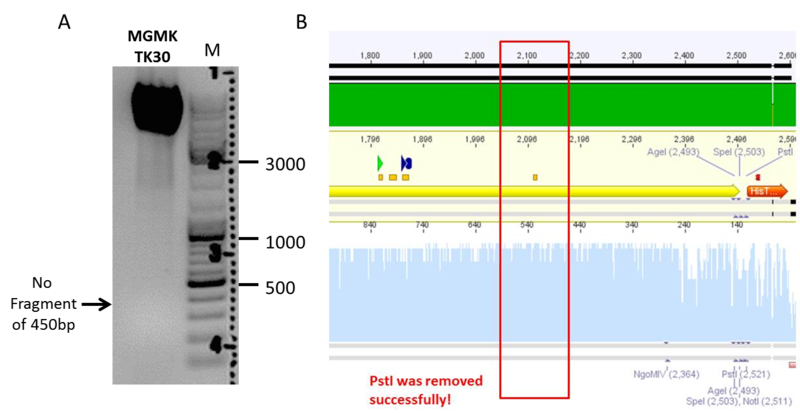 Figure 1 demonstrates one example of successful deletion of a PstI restriction site located within the mGMK_TK30 sequence at position 3109. A point mutation was introduced replacing the nucleotide G by A, resulting in the deletion of the restriction site while maintaining the encoded amino acid glutamine. Exchange of guanine to adenine was confirmed by sequencing (Figure 2). Figure 2: Cytosine to guanine exchange by site-directed mutagenesis using QuikChange Lightning Kit provided by Stratagene was successful as demonstrated by (A) test digestion linearizing the plasmid with PstI and (B) by sequencing. Furthermore, assembly of BioBrick-compatible vector plasmids was performed. An example for the last assembly step of mGMK_TK30 and hGH_rITR is shown in Figure 3. The plasmids were digested with both XbaI and PstI (New England Biolabs, Insert: BBa_K404116: hGH_rITR) or SpeI and PstI (Vector) and loaded on an agarose gel. As demonstrated in the preparative gel in Figure 3, the expected bands were detected under UV light and the extracted, subsequently purified DNA was successfully ligated and transformed into E. coli. Each assembly step for producing the BioBricks was conducted following the iGEM BioBrick standard. Figure 3: Assembly of mGMK_TK30 (vector molecule, in pSB1C3) and hGH-terminator_rightITR (insert molecule). The digested fragments were visualized under UV-light and correspond to the expected sizes. Tumor cells, transduced with viral particles encapsidating the effector constructs containing the mGMK_TK30 driven by the CMV promoter, were cultured both in presence and absence of ganciclovir (Roche). Morphological changes were monitored via phase-contrast microscopy for 48 hours post infection. As it can be seen in Figure 4, non-transduced tumor cells treated with ganciclovir and transduced cells without ganciclovir did not show significant cell ablation. In contrast, transduced cells expressing the guanylate kinase - thymidine kinase fusion protein showed significant cell death after incubation with ganciclovir for 48 hours post infection. Figure 4: Qualitative analysis of cell death induced by conversion of ganciclovir to ganciclovir-triphosphate by virus-delivered guanylate - thymidine kinase (mGMK_TK30). 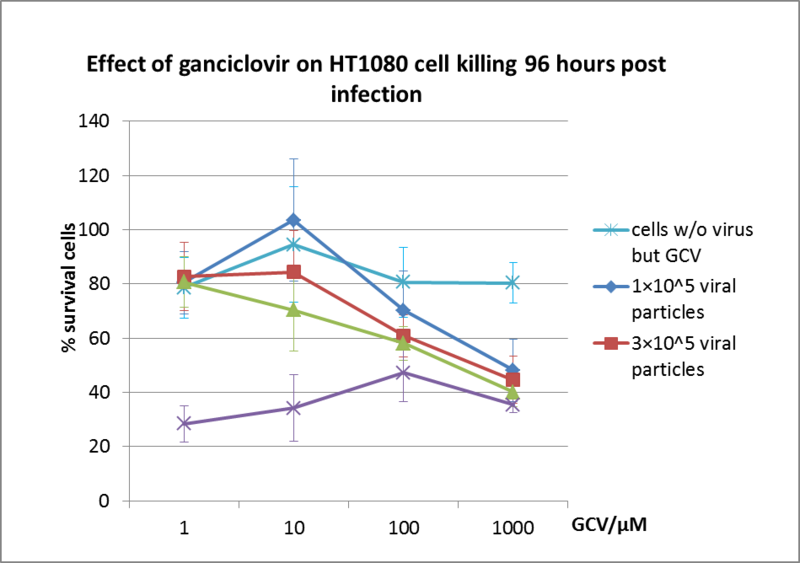 A: Non-transduced HT1080 cells incubated in the presence of ganciclovir not exhibiting cell death. B: Untreated transduced HT1080 cells showing a high survival rate. 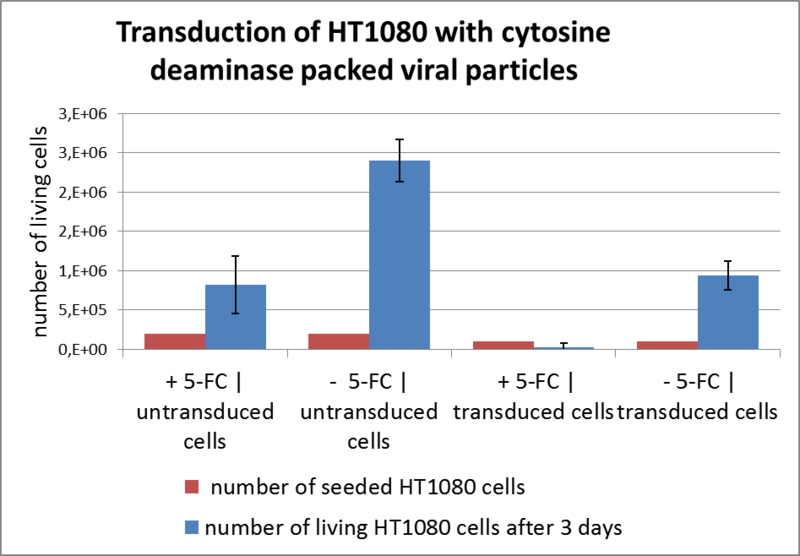 C: HT1080 cells transduced with 300 µL viral particles and incubated with ganciclovir leading to tumor cell ablation. D: HT1080 cells transduced with 600 µL viral particles and incubated with ganciclovir leading to ablation of tumor cells. Suicide gene therapy is based on the localized conversion of non-toxic prodrugs to toxic substances (Greco & Dachs 2001), promoting cell death in the tumor tissue (Figure 5). Directed gene delivery is achieved by using recombinant viral vectors as provided by the iGEM team Freiburg_Bioware 2010 within the Virus Construction Kit. Figure 5: Overview of the suicide gene therapy approach. Non-toxic prodrugs are converted into toxic effector molecules leading to cell death of the tumor cells. Non-transduced cells can survive in the presence of ganciclovir since the prodrug is not toxic for these cells (Figure 4A). The demonstration that transduced cells are viable in the absence of ganciclovir confirms that cell killing is indeed induced by combination of the delivered thymidine kinase and treatment with ganciclovir. Viral particles encapsidating the suicide construct mGMK_TK30 are efficient in directed gene delivery, thus leading to cell death of transduced cells due to overexpression of mGMK_TK30 and prodrug conversion. The cell-toxic ganciclovir-triphosphate is incorporated into the nascent DNA chain leading to replication termination and finally resulting in death of dividing cells. Quantitative analysis of the cytotoxic effect induced by mGMK_TK30 was first conducted by flow cytometry analysis 72 hours post transduction. HT1080 cells were stained with 7-AAD and Annexin V. 7-AAD intercalates in double-stranded DNA after penetrating cell membranes of dead cells, whereas Annexin V specifically binds phosphatidylserine which is only accessible during apoptosis. Figure 6 demonstrates the relation between cell death and ganciclovir concentration. 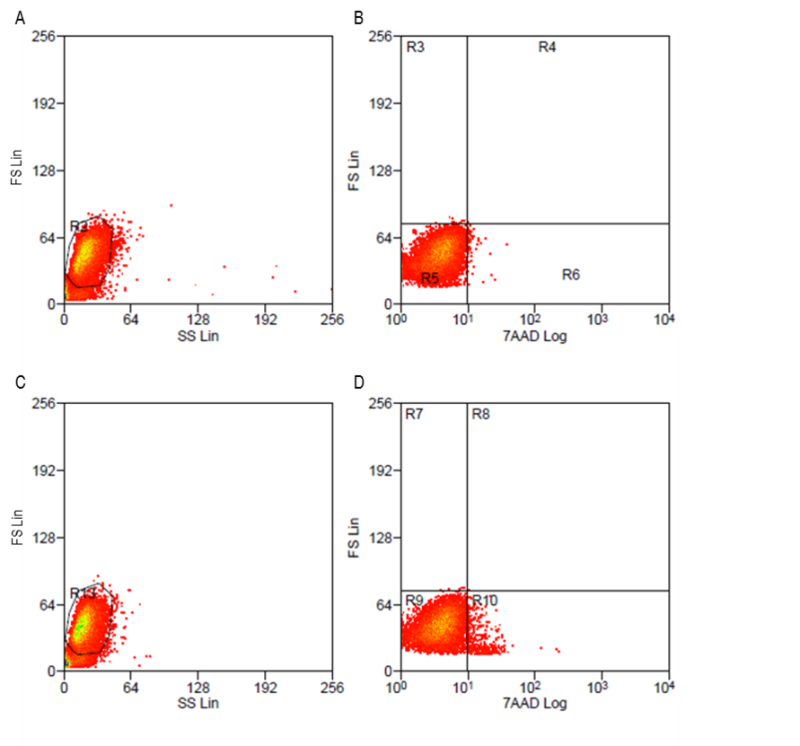 Figure 6: Flow cytometry data analysis. A: Gating non-transduced HT1080 cells (control). 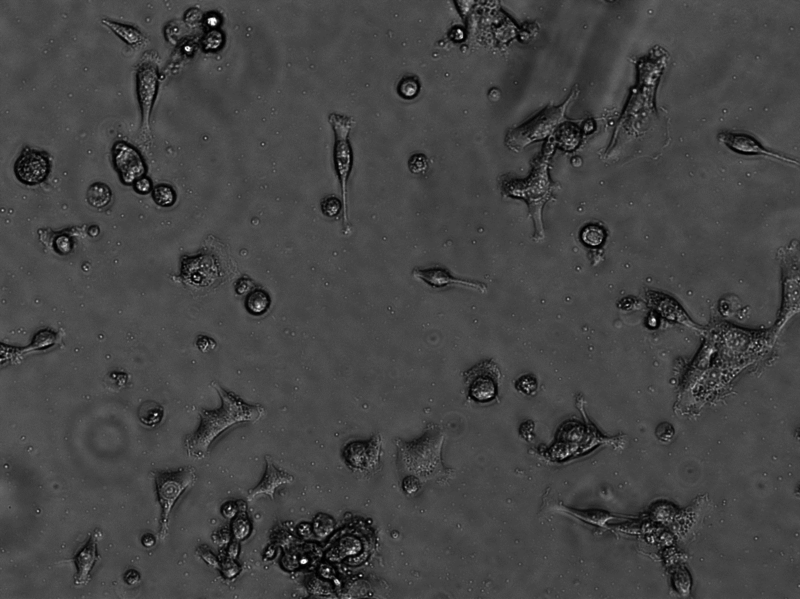 B: Non-transduced cells without staining plotted against 7-AAD. 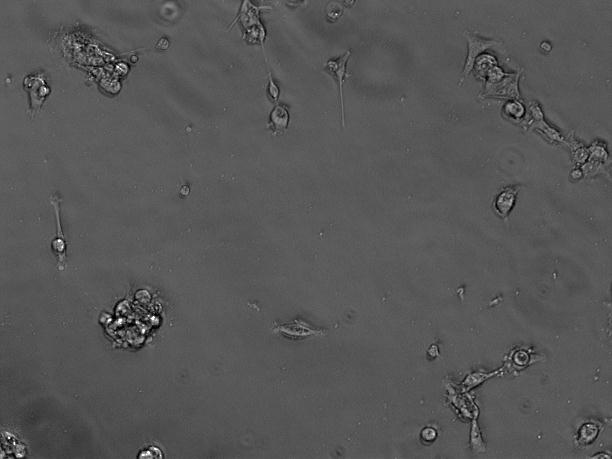 C: Gating non-transduced cells stained with 7-AAD. D: Non-transduced, 7-AAD-stained cells plotted against 7-AAD. 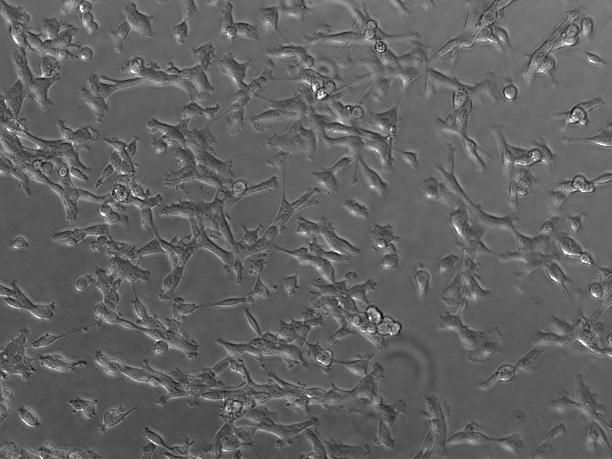 E: Gating transduced cells (GOI: mGMK_TK30) treated with 485 µM ganciclovir. F: Gated, Annexin-V stained cells plotted against AnnV-2 Log. G: Gated cells plotted against 7-AAD H: Gated, 7-AAD and Annexin-V stained cells plotted against 7-AAD and Annexin-V. Gate R19 comprised Annexin-V and 7-AAD positive cells. 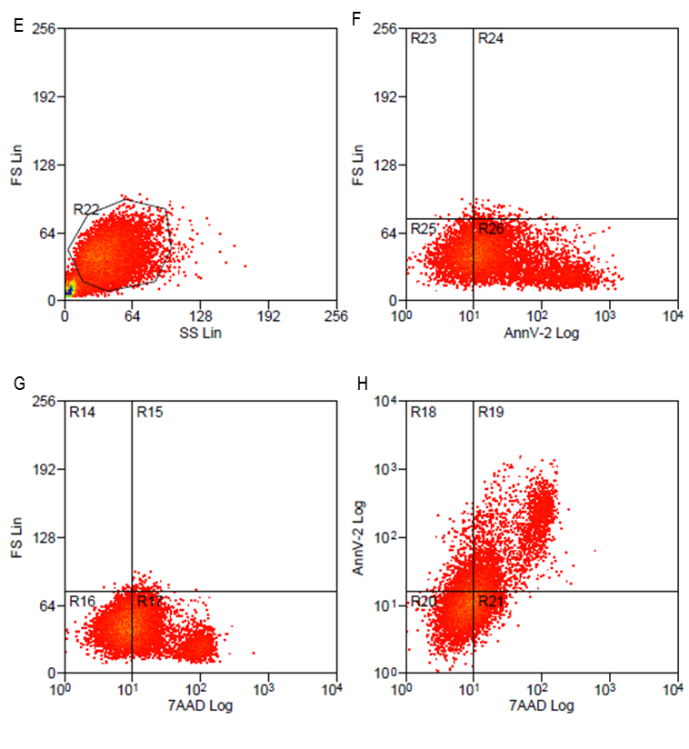 Figure 7: Quantification of flow cytometry data provided in Figure 6. With increasing ganciclovir concentration, the survival rate of cells decreases. 60 % of HT1080 cells treated with 4.85 mM ganciclovir show tumor ablation, however even lower amounts of ganciclovir lead to significant cell death. 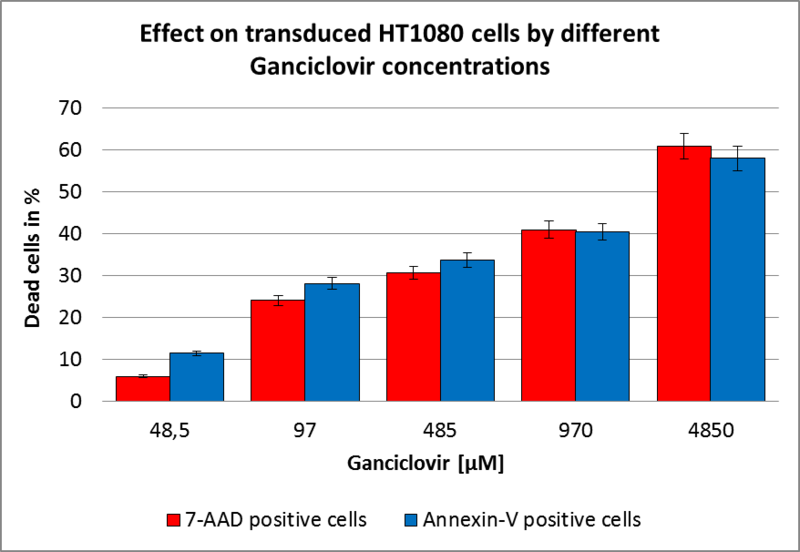 The effect of different ganciclovir concentrations on transduced HT1080 sarcoma cells was investigated. Transduction was performed with recombinant viral particles encapsidating the mGMK_TK30 prodrug gene. 72 hours post infection, cells were stained with 7-AAD and Annexin V. As Figure 7 shows, the fraction of killed transduced cells is proportional to the applied ganciclovir concentration. Further analysis of the cytotoxic effect induced by thymidine kinase converting ganciclovir to the toxic anti-metabolite has been performed using MTT assays. 3-(4,5-Dimethylthiazol-2-yl)-2,5diphenyltetrazolium bromide), also known as MTT, is a yellow-colored tetrazole, which is reduced to purple insoluble formazan in the presence of NADH and NADPH (Roche n.d.). Colorimetric analysis can be carried out via spectrometry. Different tumor cell lines, HT1080 and A431, were transduced with the recombinant viruses carrying the linear DNA construct coding for mGMK-TK30 regulated by the CMV promoter and subsequently treated with ganciclovir. 48 and 72 hours post infection, cells were incubated with MTT and fresh DMEM. After cell lysis by DMSO, absorbance of formazan at 570 nm was quantified using a Tecan Sunrise plate reader. 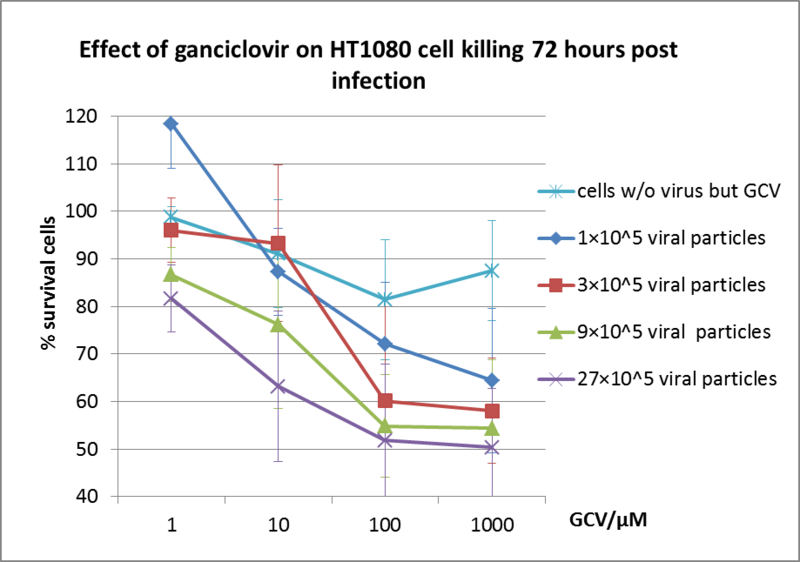 Figure 8: Effect of ganciclovir on HT1080 cell survival 72 hours post infection as (A) two dimensional plot of survival of cells and (B) three-dimensional plot of ganciclovir, virus particles and cell survival. Figure 9: Effect of ganciclovir on HT1080 cell survival 96 hours post infection. (A) two dimensional plot of cell survival (B) three-dimensional plot of ganciclovir, virus particles and cell survival. Data of MTT assay quantification are shown in Figure 8 and Figure 9. HT1080 cells were infected with viral particles containing the mGMK_TK30 transgene. 72 h- and 96 h post infection and addition of ganciclovir, cells were incubated with MTT. Changes in absorbance were measured and survival of cells plotted against ganciclovir concentration. Figure 8A demonstrates the correlation between increasing ganciclovir concentrations and percentage of cell survival. Furthermore, different virus particle concentrations were used for transduction. 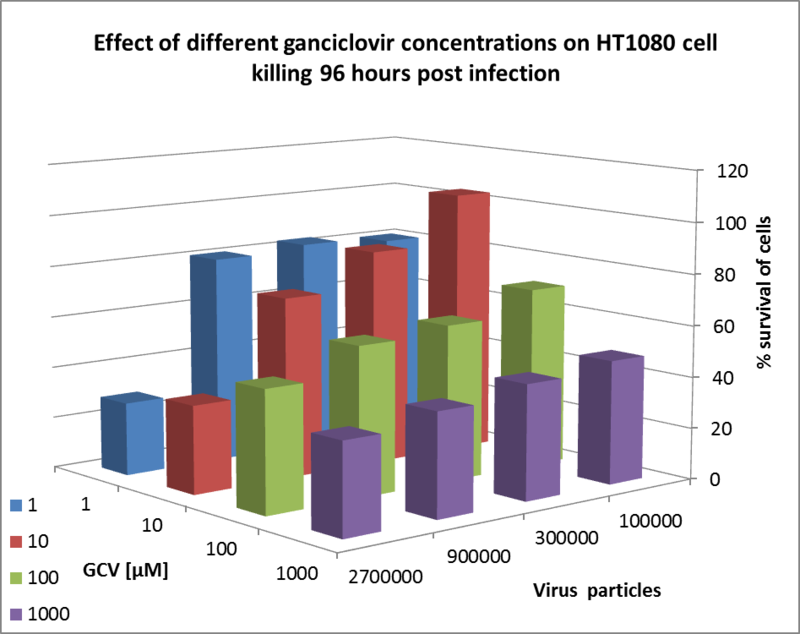 Figure 8B shows that the highest amount of viral particles combined with the highest ganciclovir concentration led to significant HT1080 apoptosis 72 hours post transduction. Additionally, 96 hours post infection cells were incubated with MTT and absorbance was quantified via spectrometry (Figure 9). Again, survival of HT1080 cells was plotted against increasing ganciclovir concentrations. The bystander effect was first reported by Moolten (1986) showing that prodrug convertase negative cells surrounded by suicide enzyme positive cells did not survive prodrug treatment. Besides efficient killing of targeted tumor cells, neighboring, non-transduced cells are killed as well, providing an important effect in cancer treatment. Since 5-Fluorouracil is soluble and can diffuse into adjacent cells (Huber et al. 1993) (Huber et al. 1994), the bystander effect was demonstrated using cytosine deaminase as gene of interest. Figure 10: Schematic overview of the Bystander effect. 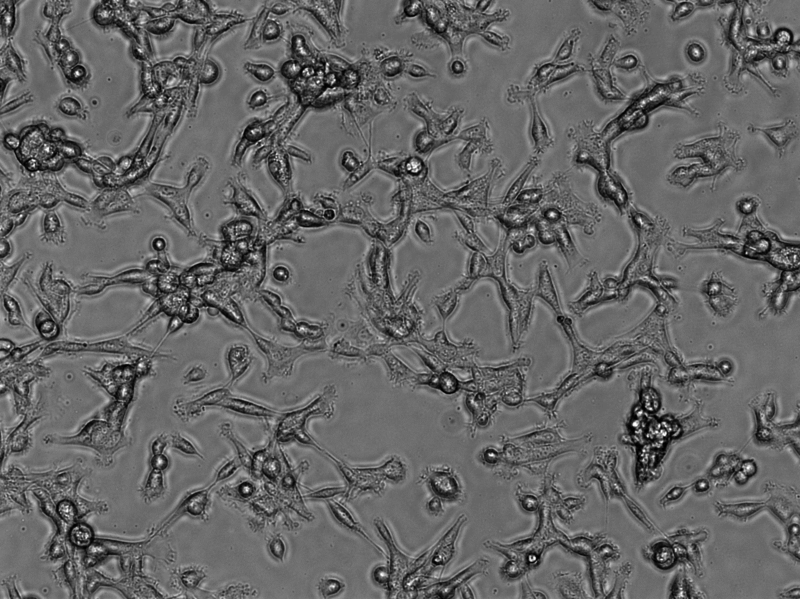 90 % confluent HT1080 cells were transduced in T75 flasks with 9 ml of viral stock. In parallel, another T75 flask was transduced with a viral stock packaged with the mVenus coding sequence to assess transgene expression. 24 hours before harvesting the CD-transduced cells, two six well plates with 200.000 cells per well were seeded. After 30 hours, mVenus expression was observed and the CD-transduced HT1080 were harvested. To minimize the influence of viral particles in the medium, the cells were washed four times with PBS. The cells were counted via a Neubauer cell chamber and 100.000 cells per well of a six well plate were seeded. Additionally, 100.000 of the CD-transduced cells were seeded onto previously seeded untransduced HT1080. The incubation with the prodrug 5-fluorocytosine (5-FC) was performed at a final concentration of 53 mM. According to Fuchita et al., this amount should be sufficient to show the functionality of the CD (Fuchita et al. 2009b). As demonstrated in Figure 11, cytotoxicity of 5-FC is remarkable. After three days of incubation in 5-fluorocytosine, the cells were washed, detached with Trypsin, centrifuged at 200 g for 5 min followed by two washing steps with PBS and finally resuspended with 200 µl DMEM. Living cells were then counted via Trypan blue staining. After this successful qualitative demonstration of an AAV2-mediated cytosine deaminase treatment, the bystander effect was quantified as well. The activated 5-FC molecules are able to diffuse through the plasma membrane and thus effect cells that are not transduced (Figure 12). 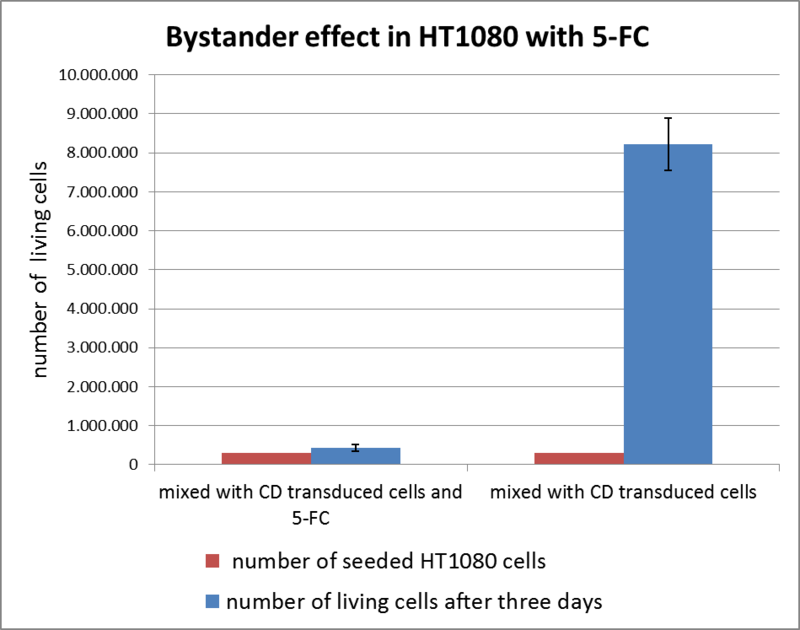 The bystander effect was tested with untransduced HT1080 cells, which were mixed with the CD-transduced HT1080 cells. The cytosine deaminase expressing cells have an obvious effect on the viability of the non-transduced cells. As shown in the graph we were able to demonstrate that cytosine deaminase mediated cancer cell death is also fatal for non-transduced cells in close proximity. Efficient and tissue-specific tumor killing is one major challenge in cancer therapy (Black et al. 1996). Gene-directed enzyme prodrug therapy (GDEPT) is based on the conversion of non-toxic substances into toxic drugs resulting in tumor cell death. The iGEM team Freiburg_Bioware 2010 provides several functional suicide genes within the Virus Construction Kit, thus offering a feasible and modular tool to the growing field of personalized medicine and the iGEM community. We successfully demonstrated cancer cell death caused by the introduction of cytosine deaminase and modified fusion genes consisting of guanylate and thymidine kinases. To prevent systemic toxic side effects of conventional chemotherapy, the iGEM team Freiburg_Bioware 2010 took a leap and efficiently retargeted the viral vector for directed suicide gene delivery towards tumor cells. Capsid engineering was successfully demonstrated by the iGEM team Freiburg_Bioware 2010. Further details can be found under Results – Targeting. Ardiani, A., Sanchez-Bonilla, M. & Black, M.E., 2010. Fusion enzymes containing HSV-1 thymidine kinase mutants and guanylate kinase enhance prodrug sensitivity in vitro and in vivo. Cancer gene therapy, 17(2), 86-96. Available at: http://www.pubmedcentral.nih.gov/articlerender.fcgi?artid=2808426&tool=pmcentrez&rendertype=abstract. Black, M.E. et al., 1996. Creation of drug-specific herpes simplex virus type 1 thymidine kinase mutants for gene therapy. Proceedings of the National Academy of Sciences of the United States of America, 93(8), 3525-9. Available at: http://www.pubmedcentral.nih.gov/articlerender.fcgi?artid=39643&tool=pmcentrez&rendertype=abstract. Fuchita, M. et al., 2009. Bacterial cytosine deaminase mutants created by molecular engineering show improved 5-fluorocytosine-mediated cell killing in vitro and in vivo. Cancer research, 69(11), 4791-9. Available at: http://www.pubmedcentral.nih.gov/articlerender.fcgi?artid=2765227&tool=pmcentrez&rendertype=abstract. Greco, O. & Dachs, G.U., 2001. Gene directed enzyme/prodrug therapy of cancer: historical appraisal and future prospectives. Journal of cellular physiology, 187(1), 22-36. Available at: http://www.ncbi.nlm.nih.gov/pubmed/11241346. Huber, B.E. et al., 1993. In vivo antitumor activity of 5-fluorocytosine on human colorectal carcinoma cells genetically modified to express cytosine deaminase. Cancer research, 53(19), 4619-26. Available at: http://www.ncbi.nlm.nih.gov/pubmed/8402637. Huber, B.E. et al., 1994. Metabolism of 5-fluorocytosine to 5-fluorouracil in human colorectal tumor cells transduced with the cytosine deaminase gene: significant antitumor effects when only a small percentage of tumor cells express cytosine deaminase. Proceedings of the National Academy of Sciences of the United States of America, 91(17), 8302-6. Available at: http://www.pubmedcentral.nih.gov/articlerender.fcgi?artid=44594&tool=pmcentrez&rendertype=abstract. Moolten, F.L., 1986. Tumor chemosensitivity conferred by inserted herpes thymidine kinase genes: paradigm for a prospective cancer control strategy. Cancer research, 46(10), 5276-81. Available at: http://www.ncbi.nlm.nih.gov/pubmed/3019523. Willmon, C.L., Krabbenhoft, E. & Black, M.E., 2006. A guanylate kinase/HSV-1 thymidine kinase fusion protein enhances prodrug-mediated cell killing. Gene therapy, 13(17), 1309-12. Available at: http://www.ncbi.nlm.nih.gov/pubmed/16810197.